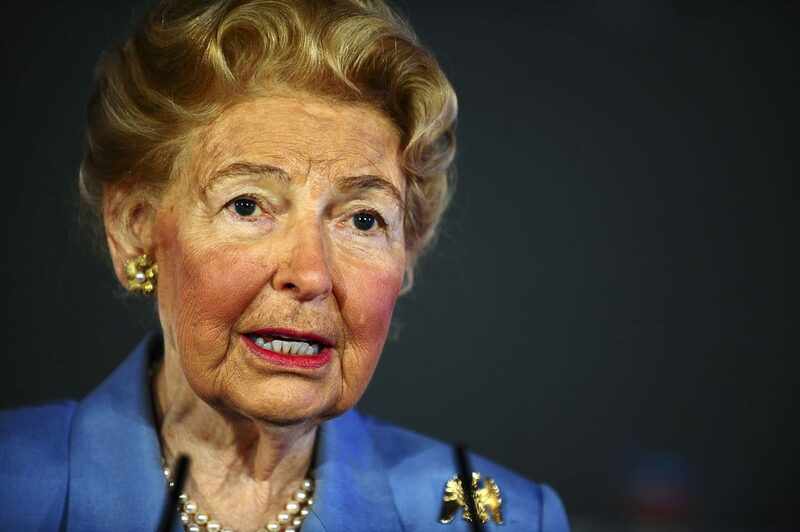 WASHINGTON (CNS) — Phyllis Schlafly, 92, died Sept. 5 at her home in Ladue, Missouri, outside St. Louis, according the Eagle Forum, an organization she founded in 1975. No cause of death was given, but she had been ill for some time. A Catholic who gave birth to six children to her husband, John, Schlafly immersed herself for most of her adult life in a host of conservative causes, including stopping ratification of the Equal Rights Amendment. Schlafly also was involved with the abortion issue, having founded and chaired the National Republican Coalition for Life. “She served the Lord, her family, and her nation to the utmost,” said a Sept. 6 statement by American Life League president Judie Brown. “Schlafly not only helped the Republican Party become pro-life in the 1980s, but spent the remainder of her life ensuring it remained so,” said a Sept. 6 statement by Tom McClusky, vice president of government affairs for the March for Life Education & Defense Fund. The effort by Schlafly to change the conversation made her a lightning rod for controversy to her ideological opposition. It continued into her 80s, when her presence as a speaker in 2008 at Washington University in St. Louis, her alma mater, drew protesters. Born Aug. 15, 1924, Schlafly did not win every battle she fought — abortion is still legal in the United States — she made three unsuccessful bids for public office, she backed Barry Goldwater for president in 1964 and the candidacy of Alan Keyes in the 2000 Republican primaries — but she was engaged in so many battles on so many fronts that, invariably, she won at least some. The ERA was her first major victory. Her group, STOP ERA, later became the Eagle Forum. “The whole notion that the church has somehow made women second-class or discriminated against them is contrary to history, contrary to fact and contrary to the beliefs of the overwhelming majority of Catholics,” she said. In 1998, Schlafly berated the Patient Access to Responsible Care Act, saying its language had “unintended consequences” that could mandate abortion coverage. The bill died in committee despite its sponsorship by a Republican congressman and it having more than 200 co-sponsors. But she lost a bid that January to have the Republican National Committee deny campaign funds to any congressional candidate who didn’t oppose partial-birth abortion. Schlafly, however, convinced the Republican Party to adopt and strengthen its platform language on abortion prior to party conventions. “Phyllis is the reason the Republican Party is a pro-life party,” said a Sept. 5 statement by Kristan Hawkins, president of Students for Life of America. Schlafly and her husband, John, co-founded the Cardinal Mindszenty Society in 1958 to warn Catholics of communism’s dangers. Her sister-in-law, Eleanor Schlafly, ran the organization. Phyllis Schlafly was also member of the Catholic Campaign for America’s national committee, 1991-94. In addition to her children, Schlafly is survived by 16 grandchildren and three great-grandchildren.